Today, My Friends, you will be pleased to know I am giving a short course in accounting. BEFORE you hit the X---give me a fighting chance--accounting is not ALL boring and dull! In the vast and titillating word of accounting, we have what used to be a set of books---thus--bookkeeping. In today's world that would not be books, but a series of computer printouts. 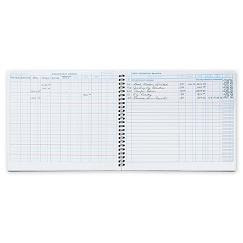 At any rate, the daily record of accounting events is recorded in a journal. 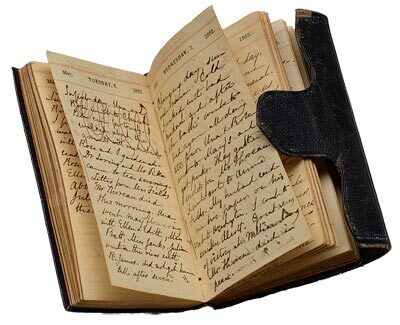 So all checks, sales receipts, purchases, etc.-the day to day operations are first recorded in these journals. NOW--hold on to the edge of your seat---at the end of the month, these journals are totaled AND the totals are transferred to the General Ledger. The General Ledger is the complete set of accounts for all assets (things you own), liabilities (things you owe), capital (what your are worth), income (money coming in) and expenses (self explanatory). 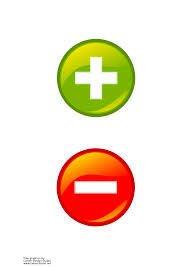 AND---DRUM ROLL---all this will be in balance---or the total of the accounts will be 0. It is accounting magic---and I am sure I have already lost you! Remember back to your days in math and algebra--the equation was always the same amount on both sides of the = sign--NOW you see the picture. All this to say---the day to day transactions are totaled and transferred to the general ledger which is a summary of the big picture. How you are doing is then recorded monthly in a set of financial statements---or the statement of operations. Fascinating I know---but the beauty of all this---when you look at those financial statements---it ALL balances---or each side of the balance sheet there is the same number. REALLY--it IS MAGIC! And it all operates on a system of checks and balances! As I was going over this exciting concept, I began thinking of the journals so many keep. The day to day record of life--sometimes a spiritual journal--other times a diary of life's happenings--but always a record of the past. Fascinating reading--well in some cases anyway! These journals become a history book. And then there are those little lists of the plus's and minus's based upon a real human being. Perhaps the list is the attributes versus the flaws of someone, or perhaps the list is what I have done for you versus the missed opportunities of what you should have done for me. You KNOW of what I speak---we keep these mental ledgers (hopefully NOT on paper) and our relationship is greatly influenced by these lists. If the minus side begins to weigh the scale down---the relationship will suffer. And then there is the Book of Life which we have been told St. Peter keeps as he guards the Pearly Gates to Heaven. NOW---this all comes from Christ giving Peter the keys to the Kingdom of Heaven (Matthew 16:19) and there being 12 gates of Pearl to the New Jerusalem or Heaven (Revelations 21:21). It is not scriptural that Peter is the one to decide who gets in and who doesn't---BUT for the sake of the blog---suppose he DID have the BOOK OF LIFE and you were standing before him asking admittance. Does your ledger balance? Are you sins offset by your good deeds? We are ALL sinful and fall short---BUT the good news---the books are balanced-your page is marked "PAID IN FULL" by Jesus. No need for your justification---HE provides the justification that you may enter---and throws open the gates widely and invites you to enter---His home of many mansions and eternally balanced books! What is the definition of "accountant"? Someone who solves a problem you didn’t know you had in a way you don’t understand. OK Lulu, I'll stop making jokes about accountants. Except ... Why did God invent economists? So accountants could have someone to laugh at. And now about St Peter ... a man arrives at the Pearly Gates and St Peter checks him out on the laptop. Apparently the man did nothing good in his whole life except once he gave 10 cents to a poor man in the street. 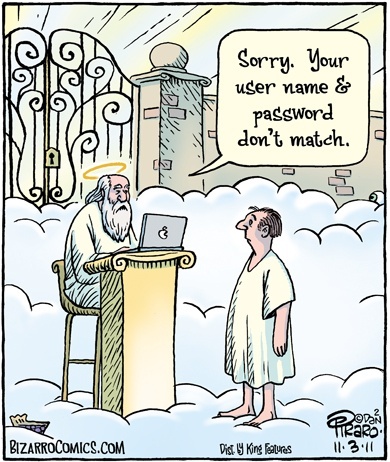 St Peter is confused and e-mails God for advice. God responds: "Give him his 10 cents back and tell him to go to hell." So there you have it. God and St Peter love accountants, I understand. I knew an accountant once at work. What a figures! She looked like the number 8. She had success written all over her. The other accountants had done it with indelible pens. (I hope you have a sense of humour Lulu; or else I'm in trouble). Oh Victor!! Started me day with a laugh ! Perhaps you should give me your job title! I had several job titles in different jobs: mostly manager or senior consultant. People used to consult me about managerial things and I used to say: "I don't know. Why ask me? I only work here! Just have a coffee break until the problem goes away. Or pass it on to someone else." Oh my gosh, Victor (giggling)---you made me day. You do know, Lulu, I despise math---this coming from someone who has to take Liberal Math this semester. yick. Have a beautiful day, friend. Is this a new kind of math to balance the budget? Think I've heard about that! I'll tell you a true story about an accountant. I once shared a train journey with an accountant from work. Longest journey in my life. She was quite attractive but said very little. She kept counting on her abacus. The train drove past a field full of sheep. I made a comment about how many sheep there were. She replied: "There are precisely 393 sheep in that field!" I was quite impressed at how quickly she had counted them and commented on it. She replied: "It's easy. You count their legs and divide by four". Later on we passed another field. I quickly counted 179 legs. I think one of the sheep had a leg missing. Somehow the sums did not balance. Neither did the sheep as he kept falling over. Well Victor when it comes to us accountants you seem to be loaded with jokes!! Being a retired Accountant, I really enjoyed this analogy. You're absolutely correct that all our sins are marked Paid In Full once we trust in our LORD Jesus Christ. It's because of His sacrifice that we may enter Heaven, no strings attached. Only cults and people tack on traditions of men ("but you gotta do [fill in the blank] to be saved") and that is a lie. We're saved by grace, not by works, lest any man should boast. Period. End of Statement. We, birds of a feather, Sparky----BUT we seem to get NO RESPECT from Victor! Love you comment, PREACH ON, Sister!